Big Brother Spoilers > Big Brother Canada > Season 1 > HOUSE GUEST TASK: Suzette & Aj Dressy Double Dinner Date! 6pm Everyone is called to the living room. Suzette says that Big Brother has given her and Aj a task. She says that she and Aj have been challenged to go on a date with another house guest that is not currently in a showmance. It’s a dressy double dinner date night with Suzette and Aj. Peter says he won’t eat any of it so don’t pick me. Suzette says that she will go on a date with Peter and Aj will go on a date with Talla. Peter says that he will just eat bread. They also have to assign jobs to the other house guests to complete the task within the 2 hour time limit to earn a reward for the whole house. Everyone needs to dress up. They are cooking a steak & lobster meal. Suzette says that we have chosen Peter and Talla. Peter says that he won’t steak or lobster but that he will make it work. Topaz & Gary are the entertainment. 6:10pm – 6:25pm Big Brother switches the live feeds to the hush, hush screen. 7:05pm Still Hush, Hush.. The live feeds will likely not come back on until after the house guests have tried to complete the task within the 2 hour limit (around 8pm). 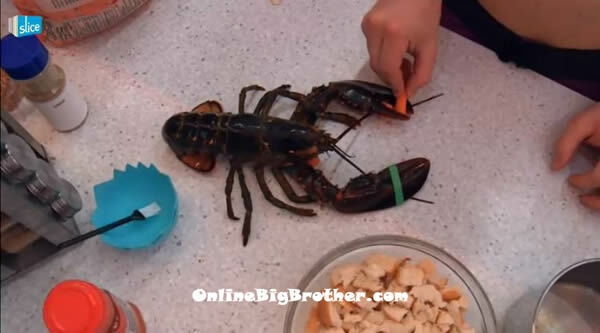 8:02pm The feeds are still blocked..
8:56pm – 9:15pm The live feeds return: Jillian is in the kitchen cooking. She asks Suzette if she was allowed to pick one of them (Jillian or Emmett) or not at all. Suzette says that she could have picked one of them. She says that she picked Talla and Aj picked Peter. Talla says that she is heading to bed. Gary says okay, me too! Suzette says awe I was hoping for a party… reward for everyone. Gary comments that something in the kitchen smells like a$$. Topaz smells what Emmett & Jillian are cooking and says its that. Gary asks and you’re going to eat that?!! Suzette asks Peter how the potatoes were? Peter says great, everything was great. Suzette says now you now I can do improv. Peter says yeah you did great. Suzette says everyone did great. They comment that the episode that it airs on will be hilarious. Suzette says they were just hoping the other participants would get more.. Gary says if I poop I might poop out my heart! Jillian asks what? Gary repeats himself. Jillian says you pooped.. GOOD! They comment about how they got a reward of strawberries and chocolate (fondue). Jillian and Emmett realize their food is way to salty. Emmett tries some and spits it out. They try to washing it under water. Meanwhile out in the backyard the air hockey games continue.. Emmett beats Andrew. Andrew tells Emmett that he is good at everything. Emmett laughs and says not everything. Andrew says that he is going to go puncture all of the milk. Emmett laughs. Andrew says I hate everything. Let me get this straight, Peter said “don’t pick me” (because of his dietary restrictions) and Suzette goes “I choose Peter”….WTF? I’d replace “dietary restrictions” with “dietary psychosis” but that’s mean. It is weird she picked him for a dinner date. Is that her being mean or clueless? Peter needs to play the game or go home and eat chicken nuggets. I would love for Peter to show his true self. He is always speaking his mind and yelling in the diary room. He needs to start saying some of that stuff to peoples face. Hopefully we missed the part of the task where they had to name who they’d least like to go on a date with and got stuck with that person, lol, otherwise, yeah WTF Suzette? Ahhh…AJ picked Talla…I think he is crushing bad on that girl! They would make a cute couple! I have a question about Alec. What is on the side of his ribs. Is it a tatoo that he has scribbled off with marker or is it something else?? Does anyone know? So it is not scribbled out? I am going to have to try to grab a picture and blow it up because it looks pretty messy. I guess I don’t get why someone would get a word tattoo that you can’t read. I thought maybe he scribbled it out because he didn’t want it all over the internet like his private parts. good luck. it’s impossible to read. i don’t think it’s scribbled out though. it just looks like some greeting card font to me. So looks like Gary is safe because Gary is getting a great edit and Canada will vote for him to win HOH. Peter is being so mean what a anti social creepy he is being. Why can’t these people just play nice when BB gives them something? I am glad Topaz and Alec are not on the dinner date. Alec, Topaz and Peter all need to go home. All Alec does is wine and let everyone else do the dirty work, Topaz is either sleeping or complaining and Peter is anti social and yells in the DR so were is the game play the are boring. Unbelievable how much they take the live feeds down sure glad we don’t have to pay for them. Gary is the best on this show.I hope the spinoff for Gary comes .Team glitter!!!!!!! CBC radio a few years ago had a chef on their noontime show and people were calling in with cooking questions. Some lady called in asking the proper way to cook lobsters. Apparently the previous year her mother had returned to Toronto from the Maritimes with 6 live lobsters. Mother proceeded to set the oven to 425 and threw them in the oven. Just the thought of that made me imagine the clanking of the lobsters as they tried to escape their slow but eventual death. You just boil it in a large pot or steam it on a grill under a large pot. Did they hurt the lobster? :( He was so cute! I wanted to hug him! I expect this receive much ridicule but I think that people are highly underestimating Peter’s gameplay thus far. I don’t consider Peter to be a “running the game” but he is sitting in a very good position right now and I think it is due to the game he has played so far. 3. His game so far appears very similar to the game Dan played in BB10 (not in BB14). He is doing everything he possibly can right now to appear weak to the other house guests and is waiting for most of them to be picked off before he starts trying to win challenges, keeping the target off of himself early in the game and setting himself up for a chance to make a run at the end. His only flaw in this plan is he doesn’t have Dan’s ability to make “genuine” connections with people (Or Misting powers) which may cost him when it comes to jury. 4. He is smart and all of the house guests know it. He should have had a target on his back for a while now but he has been successful in making himself look weak so far and guys like Gary, Alec and Emmett are all considered much bigger targets than he is. Also, I would be surprised if both Suzette and Topaz weren’t gone before Peter. 5. After Suzette leaves there will be 9 house guests left and there is not really anyone who has Peter as their number one target. I’d be shocked if he wasn’t in the final four as of right now. 6. He has done an excellent job at controlling his emotions and not getting into any altercations with other house guests (even though we all know he hates almost everybody), that is why I actually enjoy his diary room sessions. I like when players are considered honest and unassuming in the house and then they go into the diary room and talk some serious sh#t. That’s just good TV to me. Peter was my favorite the first week. We all know Peter hates people but I don’t think the other house guests really know that. Unfortunately we don’t get to see diary room comments until the actual shows. Peter is defintely playing the smart game but it is a very boring game which is not good for television. It appears that if votes are left to Canada then it will be a popularity vote and the squeeky wheel gets the grease. I have to admit that I am a floater. It takes me a long time to decide which HGs to root for each season. As time goes on and i can see the HGs game, then I start to have respect for that game. Along the way, my feelings change about each of HGs based on their behaviours in the house. I didn’t like Gary at first, and now I like him (but kinda starting to dislike him again, but for a totally different reason). Topaz and her disrespect for BB makes me not like her. BB is a job as well as a game. But it’s also a concept. BB controls what goes on. Plain and simple. She should read 1984 for a better understanding. The 3 stooges are growing on me (with the exception of Talla. She remains an annoying fascination as always). The showmances are not as irritating as they were for me at the beginning because I can see now they are not necessarily a force in the house. I don’t have any respect for the showmances cuz watching people play house, meh, not so much fun. And Peter, i still don’t know what to think about him. I loved his DR’s at first because he was imitating Dan. But, yes he is lackluster. But i realize at this point in the game, the HGs are feeling the pressure of being locked up for so long. And the paranoia is setting in (talla). What I don’t understand is how the HGs are not totally ticked off at Topaz? I know they don’t like her disrepect for BB, but the fact that no one has mentioned the alarms (that they had to sit thru while topaz continued to sleep) just boogles my mind. Why has no one talked about her selfishness and the disrespect she has for the other HGs because of the alarms that are her fault? Are they just trying to keep a low profile? (no outbursts? no target?) Or is it just because they are Canadian. OMG. twitter asks how you like Tom and Liza’s matching tattoos. They both got the “Veto” symbol on them. Omg I’m so happy Garry won that prize. Thtey’ll be ready for a big surprise next week. Dramaaaaaa. I hope gary Or Topaz wins HOH competition next week. I don’t want them to leave. The show would literaly be extremly dull if they left. Andrew I can’t stand him he is so annoying and besides he said during his hoh win that it was fine and that he didnt hold any hard feelings …..but know he still annoyed about the alec letting him win. And know hes just grumpy and annoying and when he messes with glitter King (Gary), Andrew YOUVE GOTTA GO HOME. Big Brother Canada: Gary won a power to veto a POV Player & ALEC CHEATED!